Innovation and entrepreneurship are growing quickly in today’s society. As more and more people are drawn into the world of small businesses and the creation of products, it’s easy for markets to become saturated. Add on the endless work schedule of an entrepreneur, the stress of building somethinag from the ground up, issues with funding, and more – it doesn’t take long to realize the life of an entrepreneur isn’t always as easy and glamorous as it’s made out to be. While it’s easy to get bogged down, it’s important to focus on the task at hand and remember why you started your business in the first place. We know staying motivated isn’t always easy, but we’ve got some tips to help you out! Your goals. Your achievements. Your plan for your business. Motivational quotes. What you’re working toward. The list could go on! Writing these things down will help you when you get lost or feel like giving up. They’ll serve as reminders for why you do what you do. We know, we know. Often times the draw of entrepreneurship is the flexibility it provides. But it can be helpful to set some type of a routine for yourself when things start to get difficult. Choose a time to work, a time to be most productive. Whether that’s early in the morning or at night, figure out what works for you. Set a time to get up each morning. Knock out specific things first. A little bit of a routine will help keep you grounded. Sometimes innovators and entrepreneurs get caught up in the “coolness” factor of always working, never sleeping. This is a mistake, we promise! Get plenty of rest. Set aside some “you” time. Carve out time to spend with friends and family. Although it might seem that way sometimes, work can’t be everything, and a great way to keep motivated is to step back every now and then. Shameless plug, but this is where we come in. Get a membership here at Launch Terre Haute and figure out for yourself what being around other like-minded people can do for you and your business. Staying present and placing yourself in situations where you can connect with and be motivated by others will keep your goals in focus. Remember what your life used to be like. 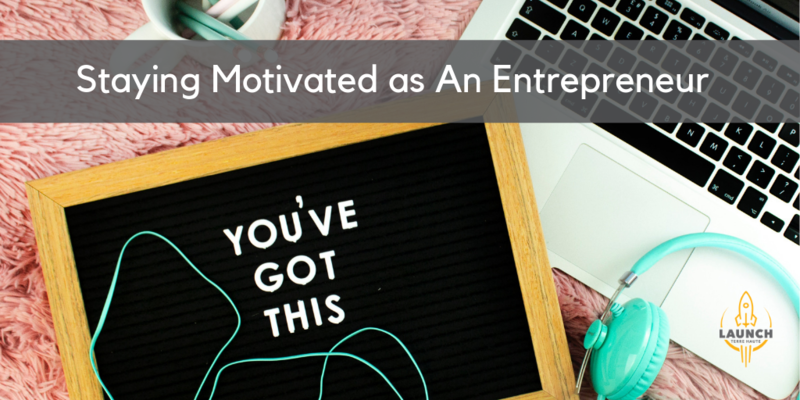 It’s easy to become fed up with your current situation every now and then, but when that moment arises, force yourself to think about what your situation was like before you started on your entrepreneurial journey. Did you have a terrible commute? Did you hate not being your own boss? Remember why you took this leap in the first place. That’s always motivation enough. Recognize that innovation requires a very specific mindset. Things will be tough. You’ll face certain obstacles that your peers may not experience. But remember why you started your business. Think about all the good your business has done and will continue to do. Remind yourself that there’s always tomorrow. Motivate yourself however you need to and keep doing great things! Want to learn more about coworking here at Launch, contact us today. Or, stop in for one of our many upcoming events where you can meet more of the innovative community we have growing and thriving here in Terre Haute.